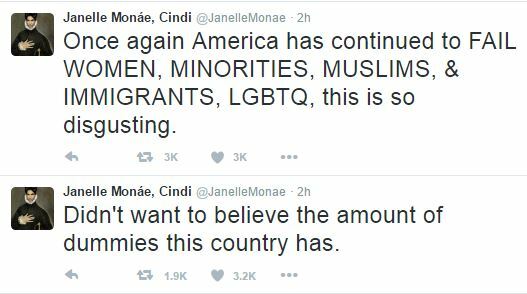 Following Donald Trump‘s unbelievable win in the 2016 U.S Presidential Election, some celebrities have reacted to the shocking turn of events. 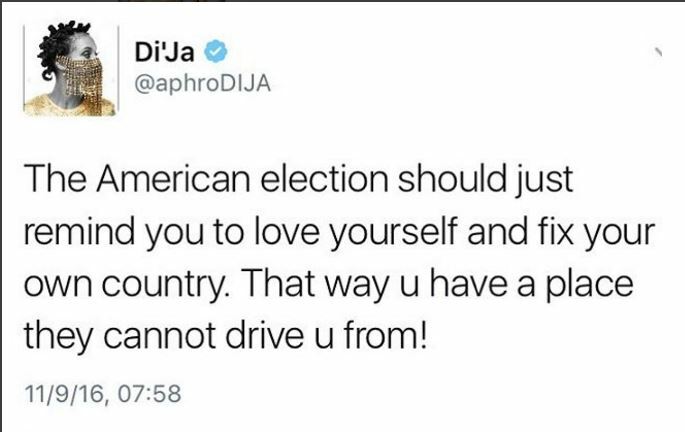 Mavin Records’ singer, Di’Ja took to Instagram to share her thoughts on Trump’s election. Maybe it is time to stop running to America every time we have a problem in Our own country. It takes hitting rock bottom to hit Reset! This election should remind you THERE R OTHER COUNTRIES OTHER THAN AMERICA that have potential for greatness. What you forget is THEY built their country with YOUR RESOURCES and support of YOUR labour. YOU TOO CAN BUILD YOURS. It is not the end of the world. It is the beginning of a new one. TRUMP or HILLARY sha fix your own face! WE ALL HAVE WORK TO DO! After facing backlash for the post, she went ahead to write another post on why she made the comments in the earlier post. See it below. I am waiting to receive Prof.Soyinka at the airport.When are you returning back sir? That’s right, he said he was going to rip-up his American green card. I’d like to see that. I also hope he didn’t initially rip off his Nigerian green passport o? Cus he’l surely need that one. Else, baba you go hang for air o! Nigerians have no pride. Fighting to be associated with America. Queuing for visas and desperately looking to travel abroad and seeing it as an achievement. The majority of individuals that voted for Trump have never left America and have no idea where Nigeria is, but you all will be looking for visa up and down. Dija is right. Face your own backyard and build up your country so that your grandkids will never have to leave Nigeria for healthcare, education, work or even shopping. Nigeria is a failure full of proud people that haven’t achieved much apart from stealing and sending their kids abroad. Dija is not at fault for her parents decisions or any of our forefathers or politicians that have failed this country. Now that we have sense why are we not Making Nigeria Great? Instead of attacking the girl look inwards, build a country that works, build a country your children, grandchildren and great grandchildren can be proud of. If anyone ever needs to travel let it be because they want to explore the world, not because they need to proper healthcare, education and work. If your country had adequate healthcare will she have to travel to another continent to ensure safe delivery ??? Why you so mad though? But why is she silly? America doesn’t care about you so why are you defending America and being abusive online? Nigeria has the one highest mortality rates in the world. Do you know how many women/babies die during childbirth? For every 1,000 births in Nigeria 95 will die. For every 1000 births in America 6 will die. Why? Because your politicians and businessmen have robbed the country blind instead of providing adequate healthcare, education and jobs to make this country a safe place. Why should she pay the price of others that have ruined this country. She is saying we should build up this place so we won’t have to go abroad. I think you have misplaced pride. Let us wait and see if Buhari will congratulate him as Hillary don fail na. As the real breeze don blow now I siddon dey wait to see the chickens bum bum. If Nigerians in Dispora will seriously join hands and deal with administration that has refused to do anything to build this country other than witch hunting. Congratulations Trump. Africans must wake up by fire by force. Watch out for the mandatory, real and sincere change. Buhari hasn’t congratulate him. Waiting for the talkative to swallow his words. You have no right to complain about peoples worries because you and you silly crew campaigned for this Buhari government and you have never complained about the hardship people are going through or even encouraged them , they will find another country, you dont want America anymore because they dont want Muslims like yourself, change begins with you not us because we have been working hard to help Nigeria and Northeners have been in power for severally and have not moved this nation forward. I voted for buhari and would do it again if given a chance. Pdp messed up Nigeria for years and Jonathan was the worst president. I don’t regret buhari as president. I voted for change and buhari has done much than Jonathan ever did. Nigerians were screaming change, without realizing with change comes big changes..duh. did i tell you to vote for GEJ? no but because you are empty headed you forgot GEJ and GMB were not the only candidates. The celebs are so pained and that’s what’s making me Happy about the win. 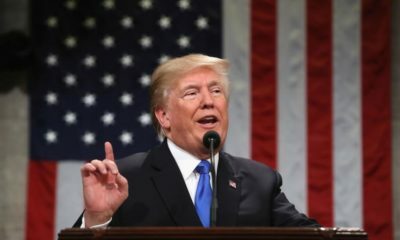 People are lamenting and will continue to do so but here’s the point, Donald Trump is the President elect of the United(Disunited) States of America. Killing yourselves wont change that fact so just live and allow him to enjoy this achievement. Now we now how celebrity endorsements are just a waste. They better shut up and cry in their abode.s. What annoyed me the most was the last minute Jay Z and Beyonce endorsement. Action as if they are Gods with the final words. If the ordinary citizenry be for you, what can celebs do. you have made some good points but hear this: she is right! even if there is some hypocrisy there, she is right. but you too are right, correct northerners need to stand up and be a part of the solution. silence is complicity. regardless us hardworkers gonna keep on moving if people want to kill themselves for false man made ideologies and dogmas with little regard for humanity – well….that is human nature. we all have our job to do here, lets just do our own. The reset you hit from hitting rock bottom, could never be learned. You need to experience it to understand it. Too many people that are of prominence today had to lose everything to start to rebuild and today, they are better for it. I work for such a man. Do not disagree based on your theoretical assumptions. Experiential situations are necessary at times in life. I actually agree with her words, its my thinking exactly. its like so what? fix your own problems and you have so many. she made good points! naijas as usually overwhelmed by the truth…. 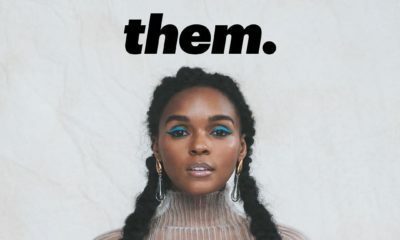 Why is everyone so obsessed with the small percentage of Nigerians that choose to live in the diaspora or have their children there? The billions that have stayed behind in naija nko? What have you achieved? People move to different countries all the time and as long as they work hard for their money then it’s fine. Nene, Dija and co I hope you have jobs waiting for the Nigerians in Nigeria that are unemployed, before asking others to return. Or if Everyone becomes self employed I hope you have customers willing to buy from them or you will facilitate their loans. I hope you also have funds to treat the sick and rehabilitate prostitutes and ex convicts.It’s just unnecessary pepper body if you ask me. … Nope too early. But by all means write about the injustice in Naija as we seek to fix it. Any thing for child brides, or the corrupt judicial system or even the recent deaths of military men in action. The Chibok girls nko? Why are people disagreeing with what she wrote? IT IS THE TRUTH!!!!! I voted for bihari, i voted for change! and i don’t regret it one bit! It WAS and IS still better than the then status quo! But i want more! Nigeria wants MORE!!! To survive, WE NEED MORE!!!!!! LETS FIX OUR OWN DAMN FACE!!! Hahahahaha, now she is talking…BTW, the america she says we should stop running to, was that not where she had her baby? so much for made in nigeria!!!!! What a myopic comment! You all can have your country Nigeria anyway. Not interested. Even though I voted for Clinton based on her middle class economics, regulation of gun laws, a Trump is better than any candidate Nigerian politics can ever produce. So nobody is scared of being driven out. The American foundation has been laid, what incoming presidents do is to improve on that foundation. The system works here and we will all forge ahead – republicans and democrats working hand in hand to achieve greatness. The Nigerian system has no foundation. There is nothing binding the Nigerian fiasco. So never ever think all it takes is to come home and fix it. 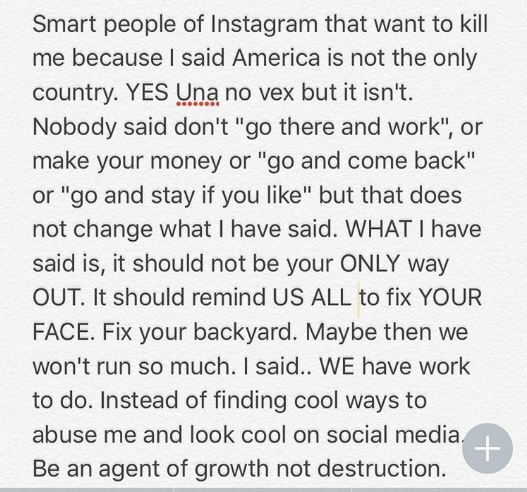 Until you all are honest to yourselves that the country needs to be separated into parts can we have a discussion about fixing. engoz, you will always be a 2nd, 3rd, or 4th class citizen in that your america. as long as i can still breathe, i have every right to stand up for what i want in my father land and i dont mind sacrificing for it. how i go beg oyinbo to respect me when my homeland no fit wipe nyansh? please…u will never be considered their equal. africa still got a chance to rise up. u have tasted the good life over there, how much sweeter it would be at home. not trying to convince you of course cuz some people are meant to emigrate to far off lands and eventually assimilate. if thats steez kudos, enjoy! And you artklub are a 5th class citizen in your own country. A country where the medical system is so messed up, a whole president flew to another country for ear infection. I wonder why some Nigerians in Nigeria are so pained about Nigerians who live abroad and love it! hello corolla, haha, i have no stakes in the matter, i have freedom of movement. i am talking strictly from my empathic and heart-filled center. i know what matters. and it seems i hit a chord. when u are done running, u can always come back home love, wink! I am an American citizen and will stay in my homeland. Thank you very much. I don’t care what ‘oyibo’ thinks about me. What matters is what I think of myself. 2nd, 3rd, or 4th class are silly labels that the insecure are threatened by. I am extremely grateful being an American citizen. It has taught me what it means to live like a HUMAN BEING and not like an ANIMAL which living in Nigeria predisposes one to. I have tasted both sides of the coin. You have to be kidding me to believe you are living as 1st class citizens in that den of lunatics where every female by birth is already classified a second class citizen. Let’s talk about the poor. I know how I suffered in that country. And the more you live in Nigeria, the more you become desensitized to issues that should shock any reasonable person. This is why I do not take your type seriously and have decided to dash you people your country. You can have it. Hopefully one day the scales will fall from your eyes. But I doubt it. When you people decide to be honest that Nigeria is not working and the country should be divided into regions with similar ideologies, we can have a discussion. Till then, I dash you Nigeria. These so called racist oyibos and the American population in general have been extremely nice to me, opened and welcomed me to their homes. Trump or no Trump, may GOD bless America! Truth is, so many Nigerians living in Nigeria despise Nigerians in diaspora, when Naira card stopped working abroad and Nigerian students were stranded abroad, people didn’t even care, any small thing, they’ll say come back home…..as for D’ija, why did you stay in Canada for years? have you forgotten that you were an unknown and a mediocre artist in Canada before they brought you to Naija? in fact I’m convinced that without that Mavin contract, you’ll still be in Canada. keep kwayet ma…. I’m confused…didn’t she live abroad until recently when she moved back to Nigeria FOR HER MUSIC CAREER? People are so hypocritical!